This group is for men and women who live in Texas, and portray Santa Claus, Mrs. Claus, Elves and helpers. Santas can be either real bearded or designer bearded. This group is for the exchange of ideas, networking, helping each other, and just general camaraderie. The group is 'governed' by a Claus Council. There one major goal: getting together a few times a year to meet and greet and break bread with each other. The only rule for this group is to talk and act the way Santa, Mrs. Claus, Elves and helpers would. Santa Jim is a founding member of the Lone Star Santas. 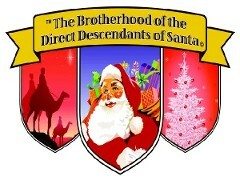 It is the mission of the Brotherhood of the Direct Descendants of Santa to spread joy, love, and the spirit of Christmas throughout the world. Santa Jim attended a special two-day IUSC workshop in Dallas entitled "Behind the Red Suit - The Business of Santa" . This covers the History of Santa Claus, The Basics of Being Santa, Talking with Children, Working for a Mall or Photo Company, The Special Events Santa, The Entertaining Santa, The image of Santa, and What Qualities do Great Santa's Possess - Character, Being Prepared - Be Organized. Santa Jim and Mrs. Claus (Madge) each earned a BSC - Bachelor of Santa Clause Diploma. Santa Jim has gone on to earn a Master of Santa Claus. This school is held in Midland, Michigan in October. For three days, both rookie and veteran Santas gather to learn how to dress, do sign language, tell stories, and even do accounting. Although Santa school does cover many aspects on how to play the role well, it's said that being Santa comes from within. "You can be made to look like Santa, but you've got to have Santa in your heart." Santa Jim plans on attending this school.